Leading Manufacturer of glass door handle, designer glass door handle and door handle for glass door cabins from Rajkot. 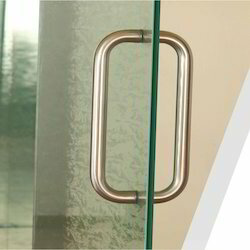 For the purpose of making the finest Designer Glass Door Handle available in the market, we engage in the utilization of high grade raw materials and advanced machinery. Owing to this, the offered range is known to have an impeccable strength and durability. Further, the offered range is widely praised for its reasonable pricing. These Door Handle for Glass Door Cabins can be easily attached to doors of residential as well as commercial buildings. Our range can be availed in choices of metals, sizes and finishes to fulfill the demands of clients.